Rapped Youth, founded in 2000, is a compelling hiphop group from eastern Finland consisting of two MCs Desert R and Homespirit P assisted by DJ Government's DJ and low-end producer Weed Jay. 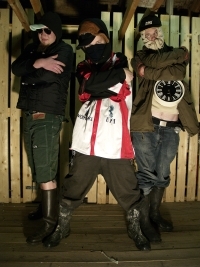 Due to a very original "nasal flow" of the leading MC Desert R and early performances of Cypress Hill cover songs translated in finnish the group has been labeled as a "Cypress Hill of the northern taiga". Even though some musical (and methodological) similarities between these two can be found, Rapped Youth is a unique hiphop phenomenon and bows to nothing and no-one - not even to their own genre. Consequently, the band itself defines their style being "modern rap-hop from the east-coast of Finland". Majority of the over 50 songs the group has recorded have been intentionally kept underground or within their own hood, far away from parental councils. Only a bunch of carefully selected gems have been allowed to be released openly by Lahna Records. The word is out that Rapped Youth would be smoking, spitting and squealing out a new record by the end of 2010.